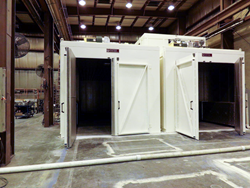 Wisconsin Oven Corporation announced the shipment of two (2) natural gas fired ultimate duty walk-in batch ovens to a leading aerospace manufacturer for composite curing of aircrafts. This customer needed the production capacity of two ovens but did not have a lot of floor space to spare. Our engineering team designed a space saving solution in which the ovens could be installed side by side to minimize the floor area used. Wisconsin Oven is owned by Thermal Product Solutions (“TPS”), a leading American manufacturer of custom industrial ovens used for heat treating, finishing, drying, curing, manufacturing automation and process control. TPS is a global leader in thermal processing products and test solutions with brands including Baker Furnace, BlueM, Gruenberg, Tenney, Lindberg, MPH and Wisconsin Oven. For more information on equipment solutions from TPS visit the website at http://www.thermalproductsolutions.com.